When time is at a premium—as it inevitably is when planning a party—every good cook looks for delicious shortcuts. And there’s a perfect shortcut for a gathering: cheese. Instead of inviting friends over for traditional hors d’oeuvres (and having to race around the kitchen preparing a half-dozen), why not build a get-together around a few great cheeses paired with some good wines? From an entertaining standpoint, there’s an added boon: Cheese doesn’t need to be kept hot, and it doesn’t need to be kept cold. The simplicity of the plan is brilliant. There’s just one problem: If you’re relying on one kind of food alone, it has to work really well with wine. Conventional wisdom has it, of course, that cheese and wine are made for each other, period. The trouble with conventional wisdom is, it’s conventional. Both cheese and wine are intricately flavored substances that change with ripeness and age. So why do we assume it will be effortless to pair such complex things? We decided to experiment. Over the course of two weeks, we tasted each of 13 cheeses with 13 wines—169 flavor combinations in all. The cheeses were not the sort most supermarkets carry, but rather high-quality, moderately expensive varieties we bought at the Napa Valley branch of Dean & DeLuca, a gourmet food store chain (we figured we all deserve the best). For every pairing, we proceeded the same way: a sip of the wine, a bite of the cheese, then another sip of the wine. Our goal was two-pronged but simple: The cheese had to make the wine taste great, and the wine had to make the cheese taste great. An extraordinary match couldn’t be one-sided: If the cheese tasted fine with the wine, but the wine tasted hollow after a bite of the cheese, the pairing was a wash. We chose wines that were excellent examples of their type and cheeses that represented a wide array of aromas, flavors, textures, and intensity levels, from absolutely mild to dramatically assertive. All perfectly ripe when we purchased them, the cheeses were Laura Chenel goat cheese from California; Le Gariotin chèvre (goat) cheese from France; Manchego, a slightly nutty sheep’s milk cheese from Spain; Vella dry jack from California; Montgomery cheddar from England; aged Mahon, a sharp, rich, nutty, buttery cheese from Spain; Parmigiano reggiano from Italy; Bellwether Farms crescenza, a soft, mild cheese from California; taleggio, a luxuriously creamy, earthy cheese from Italy; Explorateur, a pungent, buttery triple-cream cheese from France; Old Amsterdam aged gouda, a sweet-sharp cheese from Holland; Sottocenere, a truffle-studded cheese from Italy; and Colston-Bassett Stilton, a sassy, pungent blue cheese from England. 1. Contrary to popular opinion, cheese and wine aren’t an easy match. When components like salt in cheese come up against tannin and acid in wine, the result can be delicious—or disastrous. 2. In our experiment, most of the pairings were neither awful nor wonderful; they were merely neutral—you might not turn them away, but they also wouldn’t make you say “Wow!” In fact, out of the 169 combinations, only the pairings indicated as such were wows. 3. Instinct might suggest that a full-throttle, intense cheese deserves a great wine. But instinct could be wrong. Many outrageously delicious cheeses swamp great wines and make them taste like Château $2.99. 4. A flavoring on or in a cheese can change the whole dynamic. Cheeses that are rolled in herbs or spices are harder to match. If the added flavoring is strong—the cheese is studded with truffles, for example—you’ll have to be really choosy in finding a mate for it. With these caveats in mind, then, here are the cheese-and-wine combinations we thought were stellar. They would make superb fare for any party. California goat cheese and French chèvre with Schramsberg Blanc de Noirs. And goats were just the beginning. The Schramsberg was also sensational with the Parmigiano reggiano, the dry jack, the crescenza, the aged gouda, and even the Stilton. French chèvre with Robert Mondavi Pinot Noir. This combination would make a wonderful course in any meal. Dry jack with Benziger Chardonnay. Chardonnay is hard to pair with cheese, but the dry jack was an amazing match here, just as it was with the Domaine de la Janasse Châteauneuf-du-Pape. Aged Mahon with Mason Sauvignon Blanc. In this match the cheese tasted more dramatic and rich, as did the wine. Taleggio with Domaine de la Janasse Châteauneuf-du-Pape. An exceptional pairing; the wine and cheese were sensational in each other’s company. Taleggio was also a winner with the Mason Sauvignon Blanc and the Robert Mondavi Pinot Noir. Explorateur with Comte Lafond Sancerre. This was a surprise! The mineral quality of the Sancerre was just the ticket against the rich creaminess of the cheese. Aged gouda with Cline Live Oak Vineyard Zinfandel. Big drama here—a larger-than-life combo. The aged gouda was also magnificent with the Stags Leap Cabernet. Truffle-studded cheese with Domaine de la Janasse Châteauneuf-du-Pape. A sensual and intense marriage. Stilton with Graham’s Late Bottled Vintage Porto 1994. 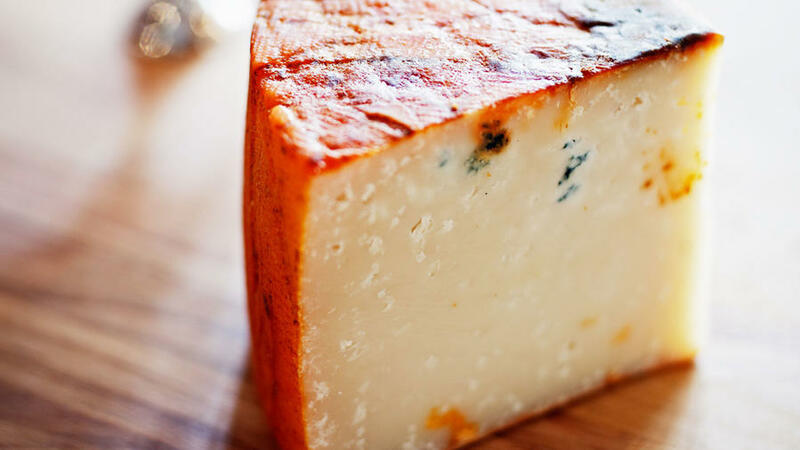 Everything you’ve heard about the perfection of Stilton and port together is true. Schramsberg Blanc de Noirs 1996 (Napa Valley). Creamy, yeasty, and elegant. Mason Sauvignon Blanc 1999 (Napa Valley). We’re big fans of this wine. It’s limy, fresh, herbal, intense, and elegant all at the same time. Comte Lafond Sancerre 1998 (France). Lean and grassy with a mineral quality—the quintessential Sancerre. Trefethen Dry Riesling 1999 (Napa Valley). A gorgeously floral Riesling with subtle hints of peach. Hugel Riesling 1997 (Alsace). A bone-dry, fairly full-bodied Riesling. Beringer Gewürztraminer 1999 (California). Full-bodied and ever so slightly sweet, with litchi flavors. Benziger Chardonnay 1998 (Carneros). Buttery and lightly oaky but not overwrought—beautifully balanced. Robert Mondavi Pinot Noir 1997 (Napa Valley). Earthy, smoky, and supple. Domaine de la Janasse Châteauneuf-du-Pape 1995 (France). Concentrated, earthy, meaty, and peppery. Cline Live Oak Vineyard Zinfandel 1998 (Contra Costa County). A delicious deep, brambly Zin. Stags Leap Winery Cabernet Sauvignon 1997 (Napa Valley). Concentrated and structured, with powerful cassis flavors. Graham’s Late Bottled Vintage Porto 1994 (Portugal). A juicy, rich full-flavored port with good structure.